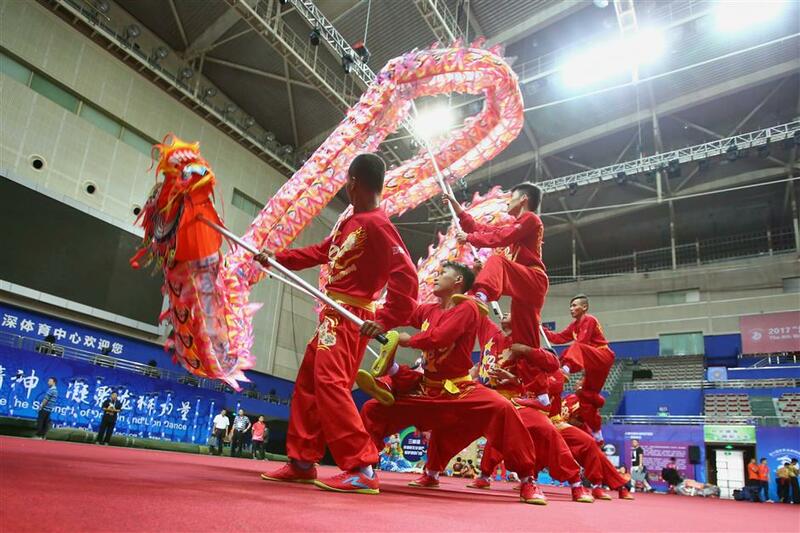 The United Kingdom, France, Canada, Brazil and Argentina are among the countries fielding teams in this year’s international dragon and lion dancing championship in Pudong. The Indonesian team called Daya Bersama, which means "glory together,” proved a tough competitor at the championship. Dragon and lion dances are most commonly associated with China, where its popularity has dimmed somewhat among the young generation, but the traditional kung fu martial arts underpinning the performances have captivated enthusiasts beyond China's borders. 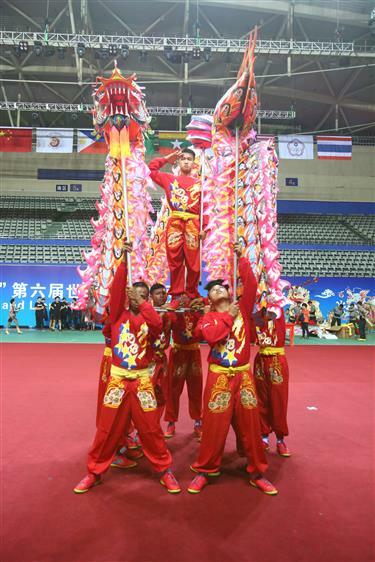 That global ardor was on display this weekend at an international dragon and lion dancing championship held at Yuanshen Stadium in the Pudong town of Sanlin. The United Kingdom, France, Italy, Canada, Australia, Brazil, Argentina and Chile are among the countries fielding teams in this year’s contest. China is represented by a team from Sanlin, which recently won a gold medal in the 13th National Games in the northern port city of Tianjin. Though the host Sanlin dragon dance team finally won the gold medal on standard style during the final competition on Sunday, the Indonesian team was among the tough competitors. "We came here to win gold," said Excel Van Harlen, 19, who takes the No. 3 spot, or the "neck" of the dragon. "Dragon and lion dances are a very important part of the culture of Indonesia." A dragon dance team normally has 10 players, including a leader who holds the “dragon ball” in front to guide the movement. Harlen said the "neck" is crucial to the success of a performance because it creates the agility and liveliness of the whole dragon body. Harlen, who is somewhat shy when out of the dragon motif, is a sophomore at the Buddhi Dharma University in Banten, which is named after the founder of Zen Buddhism and martial arts master of Shaolin Temple. He becomes animated when the subject turns to kung fu and the dragon dance. The Indonesian team is called Daya Bersama, which means "glory together.” Most of its members have been practicing dragon dancing for more than a decade. In Shanghai, they were at the stadium at 7am every day to prepare for the competition. "We are a family, and we believe we can win," Harlan said. His team failed to win a medal in the end, which saw fierce final competition with teams from Sanlin, Taipei, Hong Kong, Singapore and Malaysia. Jason Ryder (middle) poses with his coach Ash Mckenzie (right) and one of his team members. The Canadian team won the gold medal among non-Asian teams during the dragon race standard and race contests. The Canadian lion dance team also won the gold medals on southern lion standard and race contests during the final competition. From the other side of the world, a team from Canada harbors victory dreams of its own. The team won the gold medal among non-Asian teams during the dragon dance standard and race contests. Half of the team comprises young Chinese Canadians. The team leader is a 30-year-old carpenter named Jason Ryder. He takes the No. 8 position near the dragon’s tail and is considered the strongest member of the team. It’s the third time the team has entered championships on behalf of Canada. In 2013, the team won bronze. This year, the eye is on gold. "I first saw dragon and lion dances on TV and was immediately taken by the sport," Ryder said. His team, formed five years ago at a kung fu school in Toronto, often performs in the city’s Chinatown during Lunar New Year and other festival occasions. Ryder is not the only non-Chinese to be smitten by dragon and lion dancing. Facundo Martin Colman is the leader of the three-member Argentine team, the smallest in the competition. It competes in the "southern lion" segment of the contest, deploying an art that originated in China’s southern province of Guangdong. Though the team was outnumbered by its competitors, it still won a bronze medal during the southern lion race. Eight years ago, Colman watched a dragon dance in a local Chinatown three blocks from his home. The performance intrigued him so much that he began studying kung fu with a master from Hong Kong and went on to become a coach at the Limited World Kungfu Club, AR Family NG Argentina. 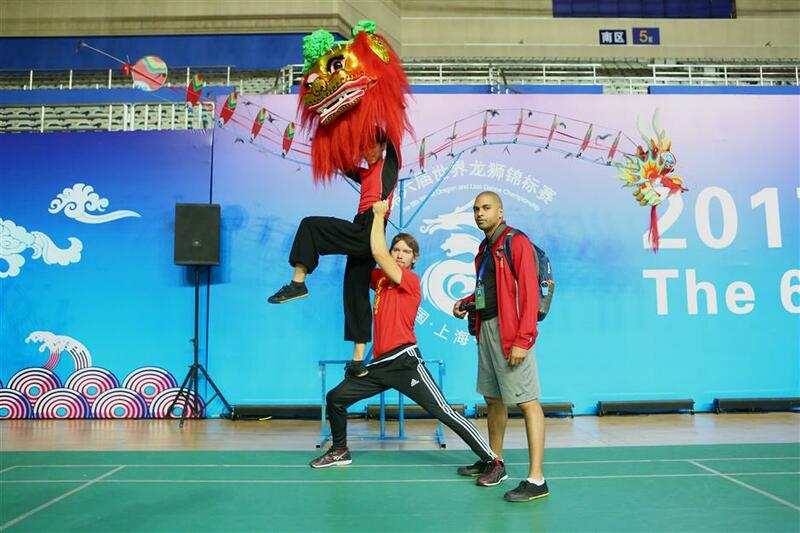 "Dragon and lion dances are full of happiness and positive feelings," Colman said in Spanish. "We mainly come here to learn so we can take knowledge back to Argentina." His team members are Hugo Alejandro Bautista 28, an English teacher, and Mariano Esteban Raul Bruno, a computer systems analyst. "We are a small team but we are proud to represent Argentina," Bautista said. 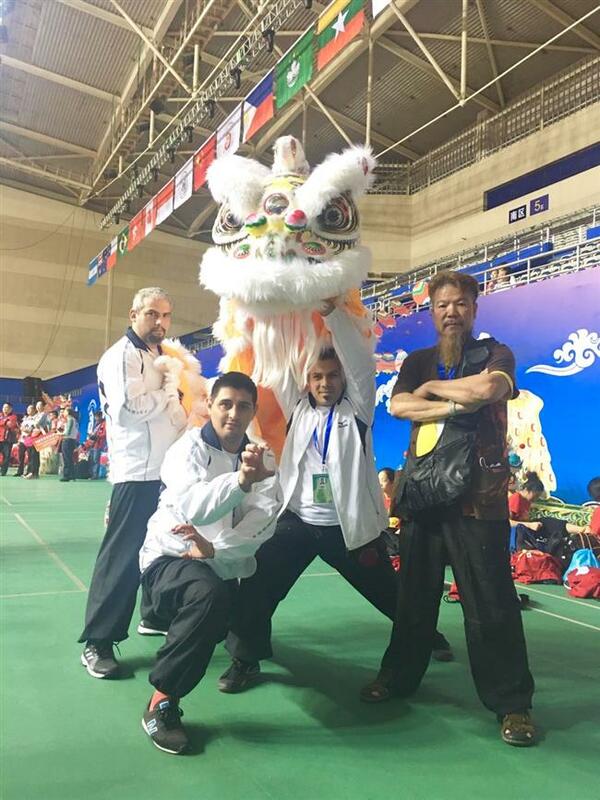 Facundo Martin Colman (second from right), Hugo Alejandro Bautista (third from right) and Mariano Esteban Raul Bruno (left) of the Argentinean lion dance team pose with Lat Yip, their coach from Toronto. The smallest team during the championship won a bronze medal during the southern lion race competition among the non-Asian teams. Traditional Chinese martial arts caused a national debate, of sorts, after a video of mixed martial arts fighter Xu Xiaodong demolishing tai chi master Wei Lei in seconds went viral online. The thrashing raised questions about whether the elegant tradition of kung fu has been usurped by exaggerated performances in TV series and movies. "Traditional kung fu is pleasant to watch but useless for fighting, compared with wrestling or Chinese kickboxing," according to one social networking site observer. Still, foreigners seem to love the sport, especially in the Americas, said Lat Yip, a senior martial arts coach who has been teaching kung fu in Toronto for over three decades. The Chinese Vietnamese is serving as chief coach for the Argentine, Brazilian and Canadian teams during the current championship. "Many of them want to learn kung fu for self-protection, especially amid more frequent terrorist attacks in western countries," he said. In the past, most foreign kung fu aficionados were drawn to the sport by the movies of Bruce Lee and Jackie Chan, he added. The southern school of Chinese kung fu, which is more focused on practice, became especially popular in South America, where concerns about personal safety run high. Yip told Shanghai Daily that the lion dance and traditional Chinese martial arts are more popular in Canada than in some Chinese cities, especially among young generations. His Toronto team performs at least three times a month, appearing at weddings and other ceremonies. Non-Chinese families and even companies often invite the team to perform. "Foreign audiences may not fully appreciate the cultural significance of a performance, but they do enjoy the happiness and excitement that the dances elicit,” he said. "We overseas Chinese don't want to see the traditional kung fu culture of our ancestors lost in the contemporary lifestyle of China. We are doing out best to promote its popularity abroad to protect it from disappearing."